According to a fresh rumor, Apple is planning to do away with movable switch controls on Apple Watch devices and will in a future release integrate solid-state buttons that rely on Taptic Engine technology to simulate clicks. The buttons also include capacitive elements for advanced health monitoring capabilities. Citing a source familiar with Apple's plans, Fast Company reports a next-generation Apple Watch will carry over the same button layout as current devices, with two active physical controls in the side button and digital crown. Instead of existing movable switches, however, the device will integrate solid-state buttons that simulate physical presses using Apple's Taptic Engine haptic feedback technology. First integrated in the original Apple Watch, the Taptic Engine is a specialized linear actuator capable of transforming advanced control signals into a wide range of feedback models. The part's magnetic drivers can start and stop movement of the large internal weight with extreme precision, allowing for highly customized haptic sensations, from light taps to extended vibrations. In Apple Watch, Taptic currently replicates taps, vibrations and even a human heart beat. The technology was later transferred to iPhone as a replacement for the handset's traditional physical home button before making its way into MacBook trackpads. A solid-state solution not only enhances hardware longevity, but enables Apple designers to create a more water-resistant Watch since the buttons do not require enlarged chassis cutouts to handle constant motion. The lack of physical switches also frees up precious internal space that will go toward a larger battery, the report said. Whether the new button technology will make its way into an Apple Watch refresh expected to debut later this year is unknown. If the design is a no-show in 2018, it will likely see introduction next year, sources said. 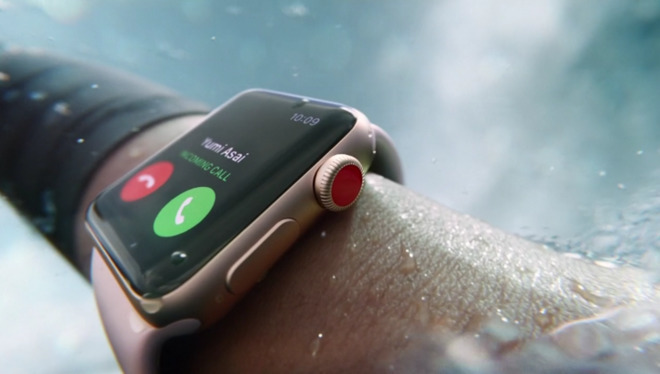 In addition, Apple is also working to incorporate capacitive sensing technology into the new button system in a bid to boost Watch's health monitoring capabilities. According to source, the design enables a second point of contact for the collection of electrical signals flowing through a user's body. While not detailed, the rumored system might be akin to AliveCor's Kardia Band EKG. That accessory includes two sensors, one on the inside of the band that stays in contact with a wearer's wrist, and another outside that interacts with a finger from their free hand. Sending a current between the sensors and across a user's chest results in an EKG reading. Apple was said to be developing in-house Apple Watch EKG prototypeslate last year, though reports at the time suggested the required capacitive elements would be integrated into the device's chassis, not buttons. Finally, today's report claims Apple engineers are working toward an Apple Watch that removes physical buttons altogether. Instead, users interact with specific areas of the device body, presumably linked to capacitive touch sensing modules, to navigate an onscreen interface. Apple is widely rumored to launch its first Apple Watch redesign with larger display, improved battery and enhanced health monitoring features later this year. The popular wearable product line has not seen an aesthetic revamp since its launch in 2015.